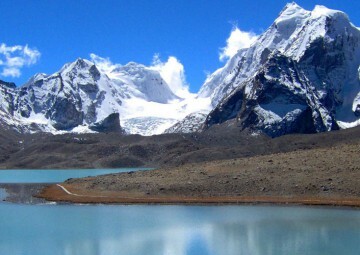 Sikkim is a landlocked Indian state located in the Himalayan mountains. The state is bordered by Nepal to the west, China’s Tibet Autonomous Region to the north and east, and Bhutan to the east. The Indian state of West Bengal lies to the south. Sikkim is nonetheless geographically diverse due to its location in the Himalayas; the climate ranges from subtropical to high alpine, and Kanchenjunga, the world’s third-highest peak, is located on Sikkim’s border with Nepal. This place is a popular tourist destination, owing to its culture, scenery and biodiversity. Sikkim’s capital and largest city is Gangtok. Darjeeling is a town in the Indian state of West Bengal. It is located in the Mahabharat Range or Lesser Himalaya. It is noted for its tea industry and the Darjeeling Himalayan Railway. Darjeeling is the headquarters of Darjeeling District which has a partially autonomous status within the state of West Bengal. The development of the town dates back to the mid-19th century, when the colonial British administration set up asanatorium and a military depot. Subsequently, extensive tea plantations were established in the region, and tea growers developed hybrids of black tea and created new fermentation techniques. The resultant distinctive Darjeeling tea is internationally recognised and ranks among the most popular of the black teas. The Darjeeling Himalayan Railway connects the town with the plains and has one of the few stream locomotives still in service in India. The trip offers you sightseeing around Kalimpong. Visit Kalimpong: Durpin Dara Monastery & View Point, Thongsa Monastery and Local Market. We do also visit Gangtok: Ganesh Tok View Point, Enchey Monastery, Institute of Tibetology, Handicrafts Centre and Local Market. Visit Pemayangste and Sanga Cheling Monastery and then proceed to Darjeeling. At Darjeeling enjoy the sightseeing of Happy Valley Tea Garden, Tibetan Refugee self Help Center, Himalayan Mountaineering Institute, Toy Train Ride, Ghoom Monastery and Local Market. You will be picked up by a private vehicle and transfer to airport to catch a flight to Bhadrapur.After finishing the immigration formalities drive to Kalimpong . After breakfast we go for sightseeing around Kalimpong. The places we visit today are Kalimpong: Durpin Dara Monastery & View Point, Thongsa Monastery and Local Market. We proceed towards Gangtok after we have a lunch. Drive to Pemayangste, en route visit Rumtek Monastery. After Breakfast drive to Bhadrapur airport via Kakerbitta. Fly to Kathmandu. On your arrival at Kathmandu you will be picked up by a private vehicle and transfer to hotel. The trip can be extended or transfer to airport for your final departure. All meals during the trip (Breakfast/Lunch/Dinner). Kathmandu valley sightseeing including all land transfers by private vehicle, experienced guide, all monument entrance fees. All transfers and sightseeing as per the itinerary by private vehicles.